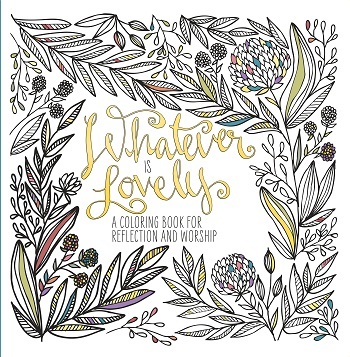 We live in a busy, hectic world—but what waits for you inside this coloring book for adults is a way to quiet the noise, express creativity, and spend some sweet time with God. Each page features an original design from one of a dozen different artists, beautifully illustrating a contemplative quote from an inspirational writer, a beloved hymn, or Scripture. Whatever Is Lovely includes illustrations from a dozen artists, offering a variety of styles to suit the tastes of a wide audience. Featured illustrators include Holly Camp, GaiaVerse, Ashley Gardner, Katherine Howe, Bridget Hurley, Linda Tetmyer, Jennifer Tucker, Andre’ Cazley, Ann-Margret Hovsepian, Carrie Stephens, Lisa Shirk, and Jenny Stewart.